We were contacted by Cardiff's new student accommodation Glendower House, they had a huge 12 meter long blank white wall screaming for attention! 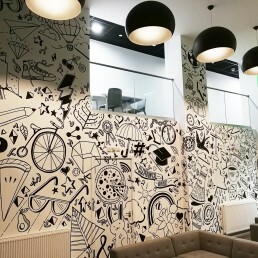 They were looking for a doodle graffiti style mural to act as creative and informative visual feature. This mural features many Cardiff/Wales doodles as well as a few personal requests from passing students who live in the building. 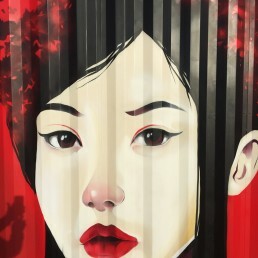 Geisha mural painted for the Welsh National Operas first ever virtual experience making opera even more accessible to 21st century audiences. Scenes from Madam Butterfly and The Magic Flute, enchanting you in through a unique form of storytelling using classical music, art and technology. Featuring an original WNO recording, this presentation will be your perfect companion if you are new to, or unfamiliar with, the world of opera. The installation will be placed outside the Millennium Centre for four weeks. The WNO are clearly proud of the project, as the shipping container will be taken to Llandudno, then back to Cardiff from Sat 23 Sept – Sat 14 Oct, before being shown off around England and culminating in an appearance at the V&A in London in January next year. 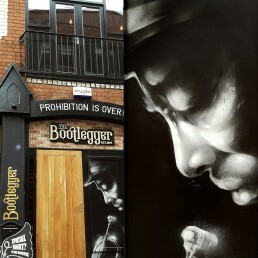 We were asked by Cardiff's finest jazz, soul and blues club The Bootlegger to paint the bar entrance on womamby street with a jazz/blues musican graffiti mural, we also painted a ghost sign style "Prohibition Is Over" mural inside. 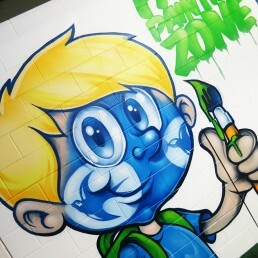 We were asked by Cardiff City Football Club to design and create a graffiti art mural for their family face painting area. The second ever Welsh Language Music Day Dyddmiwsigcymru was held on 10th February, 2017 with the aim of celebrating and promoting music from Wales to the world. 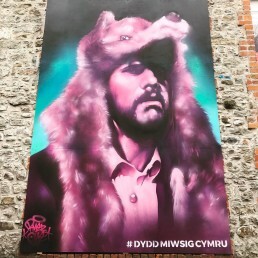 We were commissioned to paint a series of four murals around Wales featuring some some of the best Welsh talent...featuring artists Osian Williams (Candelas), Gruff(Super Furry Animals), David R Edwards (Datblygu) and Lisa Jen (9bach).